Happy New Year! I hope that all of you had a wonderful holiday season and have had a good start to 2016. How do you celebrate or get ready for the near year? Do you make resolutions? I'm not one for resolutions, but I am looking forward to making some positive changes to make 2016 a happy, low-stress and successful year. I want to focus on the little things, live in the moment, be easier on myself, and do things that help me to relax. So what does that mean for me? Well, my daughter is now five-and-a-half and halfway through kindergarten (and doing great - I am so proud of her!!!). Everyone told me the time would fly, but wow - I never thought it would go this quickly. Just yesterday I was holding my 5lb 13oz peanut and now we are writing and reading and doing math and dancing and swimming. I think this hits me harder after struggling with secondary infertility and a recent miscarriage. She is my one and only. I will never get these times back again or have these times with another child. So even when the days get busy and hectic I want to enjoy them, taking in every conversation and smile, every sweet moment of curiosity (she's so inquisitive - I love it), and everything in between. I want to say yes more. I want to smile more. I want to see her thrive and be happy. Most of all, I want her to look back on all of this and be thankful for her childhood the way I am thankful for mine. With everything I had going on last year I really let stress take over my life. How can I be a good mom or wife or friend if I am constantly thinking, worrying and overthinking everything? I needed some ways to calm my mind and body, so I started acupuncture last year and plan on continuing it this year. I was very skeptical at first, but truly believe that it has helped with my anxiety. There is nothing like an acupuncture nap! It's amazing that you can have needles inserted all over your body and still easily drift into such a deep and heavy sleep for 30-45 minutes. I also started a one-day a week strength class that I really love - I feel so energized and clear-headed afterwards, and that energy keeps flowing all day. Once we get back into the routine of this year I am going to start yoga again. And then if there is leftover time in the day I'd love to read some mindless romance or chit lit books (or watch The Bachelor :) My husband and I will be celebrating our lucky 13th wedding anniversary this year (that's us on our honeymoon in St. John). 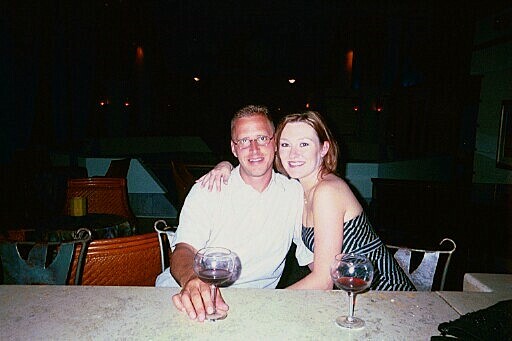 It's hard to believe that we met almost 24 years ago as young 17 and 20 year olds (and I knew that weekend that he was the man I was going to marry)! We have had so much fun together traveling and experiencing new things, making a home, and starting our family. I am so thankful for him and everything he does for us. That doesn't mean things are always easy - we have definitely had our ups and downs and often let everyday life get in the way. Making time to be a family and also time to just be us is something we have to focus on. Every time I think of how we let life get in the way it reminds me of an experience I had. A few years ago I had the opportunity to meet with a highly sought-after medium. One family member came through and the first message she had for me was to let the house go. So whenever I'm stressed out about the laundry or the messes, or when I'm nagging my husband about something with the house, I hear her voice. The house will always be here. Those everyday moments though - they won't. So while an organized house makes me so happy (seriously, tearing apart and reorganizing a closet makes me giddy), the moments with my daughter and husband are much, much more important. How does all of this relate to my blog? I started taking pictures of my food and posting recipes almost 9 years ago as a way to keep track of what I was cooking. I would share my posts with a small group of friends and was surprised when I saw my stats - I had actual strangers reading my blog!. This was so much fun for me for a while, but I did get to a point where it became a source of stress for me. When making my meal plans for the week I would get upset if I didn't have a new recipe (or 3) on the plan for that week because that meant nothing to blog. I would get upset that my pictures weren't "good enough." Or I would cook something new and just not have the time or inspiration to write the post. So after taking a step away last year (I only shared a handful of new recipes - it was my quietest blogging year by far) I found that I really miss it. Cooking is therapeutic to me and I love cooking for others. So I promise that I will be back this year, and already have several drafts in the works. I'm excited to get back in touch with all of you, share my love of cooking, and hear all of your comments and advice. Thank you for sticking with me! Best wishes to all of you that 2016 is everything you want it to be! That was a beautiful post. Thank you for sharing your thoughts and stories with us. Sending you virtual hugs (and hopefully a real one someday!). Awesome. You have a great plan for the year. What you went through last year was not easy, but your ability to step back and have a perspective check is admirable. The new year is a perfect time to reset and I love that you have a plan to make yourself and your happiness a priority.